The decision to buy a certified used vehicle is clear - peace of mind and reliability at a used vehicle price. With a solid reputation for reliability, performance, safety and value, a Honda Certified Used Vehicle is truly a great opportunity. With a Honda Certified Used Vehicle, you'll also have access to financing options through Honda Financial Services. It's not all about the numbers. Our 100-point mechanical and appearance inspection is designed to ensure that each vehicle meets the highest possible standards. We take pride in our products and our Honda-trained mechanics will scrutinize all major vehicle systems, including brakes, engine and Powertrain, steering and suspension, tires, wheels, exhaust system and the vehicle's interior and exterior. We replace any component that does not meet our stringent standards with Genuine Honda Parts, or restore it to "like-new" condition. We take pride in each step of our certification process so you'll be completely satisfied with your Honda Certified Used Vehicle. It's not just another certified program. The Honda brand always gives you peace of mind so go ahead and choose from our family of products known for reliability and exceptional quality. Why is Honda's Certified Used Vehicle Program the best in its class? Every Honda vehicle is a product of innovative engineering and quality manufacturing. Available only through our certified Honda dealerships, well-maintained Honda vehicles that are up to five model years old are eligible for certification. 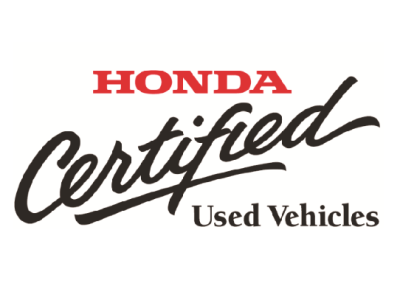 If you are looking for a reliable used vehicle, make it a Honda Certified Used Vehicle. Certified Used Vehicle programs offer significant advantages over used vehicles that are not certified. To qualify for certification, vehicles must meet the model year or mileage restrictions set out by the manufacturer. No engine or body modifications are allowed and it must pass a comprehensive mechanical and appearance inspection satisfactory to the manufacturer standards. Please also review the 6 key benefits to why a Honda Certified Used Vehicle is the right car for you. Begin your quest for a second hand car with our certified used Honda inventory and search for your Honda Certified Used Vehicle today!